Launching December 1 for $399.99 USD. Includes a PS VR headset, PS Camera, the new PS VR demo disc and a copy of Doom VFR. The Doom VFR release date is closing in and we’re excited to announce a new bundle that will vault you into the fast-paced, thrilling gameplay you love but as a totally new experience built for VR. 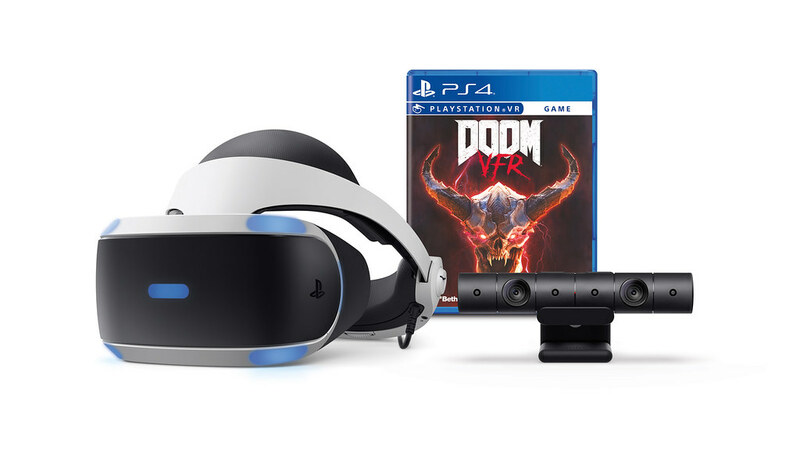 The PlayStation VR Doom VFR Bundle includes* the PlayStation VR system, PlayStation Camera, the updated PS VR Demo Disc and Doom VFR Blu-ray Disc. Doom VFR transports you to the UAC facility on Mars and the depths of Hell, as your skills are put to the test through intense combat. Set shortly after the demonic invasion on the UAC’s Martian research facility, you are the last known human survivor – until your death. Under a top-secret UAC operational contingency protocol, your consciousness is transferred to an artificial brain matrix. Your designated purpose: restore operational stability and use any means necessary to stop the onslaught of demons. The game can be played with either a DualShock 4 wirelress controller, PlayStation Move controllers, or the PlayStation VR Aim Controller to heighten your experience. The PlayStation VR Doom VFR Bundle will start to hit shelves alongside the game on December 1 across the U.S. and Canada for $399.99 USD (MSRP) / $499.99 CAD (MSRP). If you want to make sure you get your hands on one, pre-order your bundle starting today. Are you ready for Doom VFR? Will this be your first FPS in VR? Let us know! *Update: An earlier version of this post stated that this bundle includes two PS Move controllers. The bundle includes the PlayStation VR system, PlayStation Camera, the updated PS VR Demo Disc, and a Blu-ray copy of Doom VFR. It’s new version of ps vr ?? Yes. This is the new version of the PSVR. If you look at the connection piece between the front and back bands, you will see a bulbous thing with a Y shaped cut. That is part of the new PSVR unit to hold the earbuds when not in use. Yes, this bundle comes with the updated PlayStation VR system. What about the updated PS Move controllers? I like this but why does it cost $50 more than the Skyrim VR bundle? Will this also be discounted then for the upcoming PlayStation Black Friday deals? Thanks. @DuoMaxwell007 it’s even worse as this bundle excludes the move controllers. Yeah if this came out 2 days sooner maybe it would be on sale. I guess there’s always Cyber Monday to hold out for. Hi Mary Yee, based on the picture, price and the link in your post, it doesn’t look like this bundle includes the 2 Move controllers. Just in case you want to clarify that. Tomoprime, this looks like its $50 USD less than the Skyrim bundle, which would make sense if it doesn’t include the Moves. Hopefully this helps in some way. A lot of pretty great bundles for PSVR coming out these days! Thanks, soundandvision77. We went in and updated the post. An earlier version of this post stated that this bundle includes two PS Move controllers, but the bundle includes the PlayStation VR system, PlayStation Camera, the updated PS VR Demo Disc, and a Blu-ray copy of Doom VFR. Hi. What about the updated PS Move controllers (the ones with improved battery and mini USB)? Won’t any bundle include them? Or do we have to buy both separately as an extra toll even for thsoe who got a new bundle with the updated PS VR and the new camera + the old PS Moves like the Skyrim Bundle? Why your new bundles don’t include the new PS Moves controllers or at least you should have waited for them to release in order to make full bundles? The Skyrim bundle does indeed include the new Move controllers that use the same charging cord as the Dualshock 4 instead of the old PS3 era connection. Huh, figured it would have the aim controller. But whatever, glad they are bundling with real games finally. As much as I liked PS Worlds, I’ll probably never play it again unless I’m showing something to a new VR user and even then I like scaring them with Until Dawn more. I’ll probably still go for the Skyrim PSVR bundle because I know that is coming with the upgraded PSVR hardware (unlike the Gran Turismo PSVR bundle which has the original launch hardware), but it is nice to see these multiple PSVR bundles with compelling PSVR games included. This also includes the new CUH-ZVR2 model headset, but has no Move controllers. It seems silly to have three different hardware bundles for different games. You run the risk of someone wanting to buy a VR but not getting the game they want int he bundle for the savings. It would of been smarter to include a digital redemption code that the buyer can then choose which of the three choices they want once they redeem it. When do we get this, or the Skyrim bundle in the UK? Isn’t this bundle $10 more than buying each item individually? The headset is $300, the camera is $60, Doom VFR is $30, and the demo disc is free. Love PSVR will have to give DOOM a try later on. Still working through the PS4 version! This is a good sign, but I’m still waiting for that Ace Combat 7 bundle! Well, it looks like I will in fact be getting PSVR before upgrading to an HDR tv after all. What does the stand for in VFR? Same as the F in the BFG 9000 gun. Does the Skyrim Bundle also come with the updated VR Headset etc? Yes. And with the Skyrim bundle going $100 off next week, that’s the way to go if you are consider a PSVR. Buying that bundle and then preordering Doom VFR will run you $20 less than waiting for this bundle. Plus you’ll get Move controllers (possibly updated with microUSB ports instead of the 5-pin miniUSBs of the PS3 era). The Skyrim bundle’s Move controllers are the updated ones that use the same cord as the Dualshock 4 (finally). Hmmmm Xbox One X or PSVR…? Tough call, one let’s me finally play with friends online, while the other would let me try VR that may or may not work that well with my vision and potential motion sickness and minimal opportunities to use….. I dont know, $500 seems a little steep… I’m not fully convinced that either is worth it. @Fuhr31 I’m blind in one Eye 20/40 vision and PS VR is no joke works great for me and motion sickness is a non issue now they have settings for that now. PS if you want to troll go else were. i would rather play VR than the other consoles it’s more FUN! @zombie9 Thanks for the helpful info at the start of your response. I’m not sure why you decided to end with an insult calling me a troll? It’s a shame that the gaming community still has a long way to go. Keep on gaming and remember to have fun. I’ve played just about every expreience and game on PSVR… and only 2 gave me anything that felt like motion sickness: Robinson The Journey and RIGS. I would love to play Doom VFR. I i wish we could make our own glory kills but still being in a place like the U.A.C. and Hell kinda feels like you will die still I would love to play it. wish i had the money for the stuff. still can’t wait to see how this goes. Picked up the Skyrim bundle today. The hardware upgrade is worthwhile. The headset is a little lighter. The button to move the “viewer” is now on top instead of bottom. There is now an audio port on the rim near the back that lets you plug in your headphones, the ones that come with it are specially shaped to stay flush with it, and the the round side bits of the ring have grooves cut in them so you can put your earphones in them when not in use. The processor itself is now wider than long, doesn’t do the sliding thing, and allows HDR pass-through. SONT NEEDS to give original VR owners the CHANCE to trade in our black box we bought last year for the new one that has 4K HDR passthrough tech at a small fee, as not allowing us to do this makes us feel ripped off of $400, and rebuying another $400 headset is just plain WRONG just to get the same thing but get the updated passthrough tech for the 4K HDR so we don’t need to disconnect our black boxes constantly after every VR game play. PLEASE SONY, listen to your fanbase, and let us upgrade our black boxes for a small fee, or we will not support you in your future endeavors. Thanks for reading. We definitely need a way to trade-in our original PSVR boxes to a 4K/HDR capable one. I bought a PS4 Pro and HDR 4K TV and then found out that even though some PSVR games are enhanced by my PS4 pro, I have to disconnect the PSVR box if I want to play HDR games on my TV. C’mon Sony, take care of your dedicated cusotmers! Could not post it on the European blog.